Retweeting is about creating conversations and building community. We can do it all for you! Let’s say you read a tweet with a statement that you would like to share with all of your followers. The way to share that statement or “tweet” is to retweet it to all of your followers. There are two ways to retweet. One way is by using the ‘retweet’ button that appears at the bottom of everyone’s tweets. Most people retweet this way. We like to call it the conventional way to retweet. We call the other the unconventional way. Taking the statement or the tweet and pressing the retweet button sends that tweet to all of your followers. Pressing the retweet button is the conventional way of retweeting. In this conventional way, the entire statement or tweet is sent intact to all of your followers. And by intact, we mean that the whole tweet is left unchanged. The tweet is sent to all of your followers the exact same way you saw it. This includes the avatar (profile image) of the person who originally sent the tweet. There are pros and cons to this way of retweeting. A pro would be to retweet a celebrity who has endorsed your product or service, and your followers can see the celebrity’s image and tweet as he or she originally sent it. A con would be to send out a tweet that includes a person’s image, and your followers have no idea who is this person. Your followers are left wondering how this person ended up in their stream of tweets. Unless your followers look at the small print at the bottom of the tweet which says the twitter handle (name) of the person who retweeted, they’ll never know who sent that tweet into their stream. When Twitter first started, some of its early users came up with a way to share tweets while adding their own comments to the retweets. The early users figured out a way to have conversations and build community. This method of sharing is still used today. Tufel Media retweets this way. We create conversations and build community on Twitter for your brand. Copy the statement (tweet) you would like to share. It can be a tweet from anyone whether you follow them or not as long as their tweets are public and therefore visible to everyone. When you copy the statement, be sure to include the Twitter handle (name) of the person who originally tweeted. Compose a new tweet and paste what you’ve copied into the empty box as a new tweet. Add the letters “RT” to the very beginning and hit “tweet”. You can also add your personal comments before the letters “RT”. Instead of “RT”, you can also retweet by adding quotation marks to the original tweet and write your comments outside the quotation marks. Twitter limits all tweets to only 140 characters so the retweet comments need to be short but concise. And if you want to be retweeted in the unconventional way, you need to make your tweets short enough to give people room to add your name and their comment. According to a study by Dan Zarrella, tweets between 100 and 115 characters are more likely to be retweeted. Retweeting properly and building community takes skill. Our team of professionals can manage your twitter and build your brand’s community, by doing all the tweeting for you! 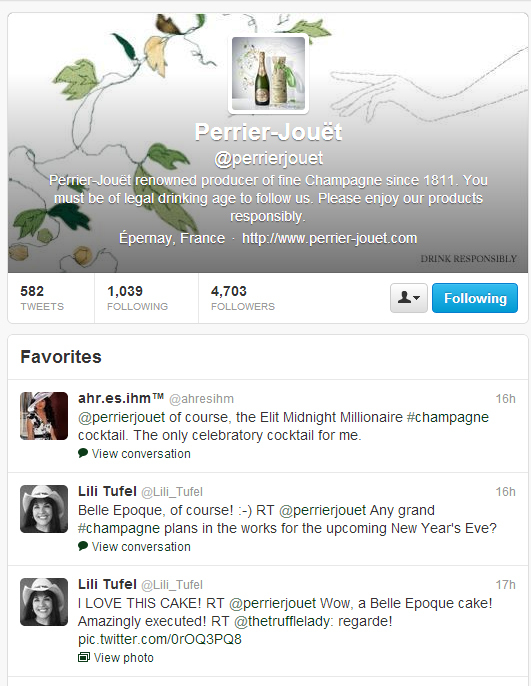 Here’s an example of how Lili Tufel retweeted Perrier-Jouët, the famous Champagne producer, and they added her retweets to their favorites.